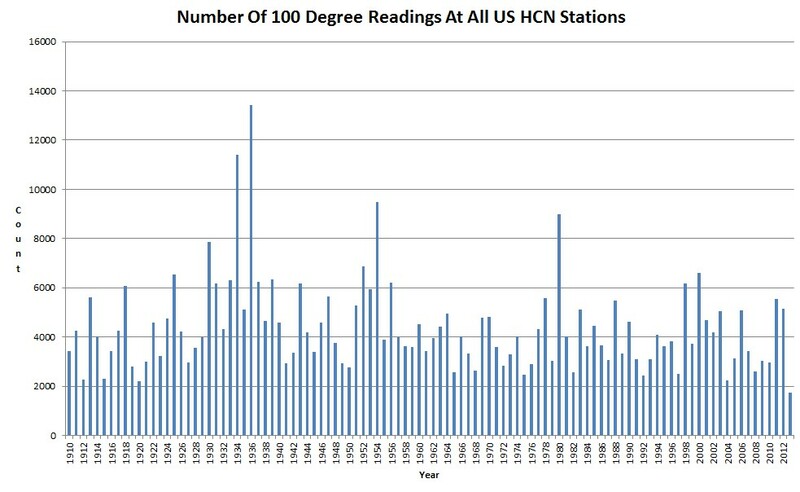 This summer, the US has experienced the fewest number of 100 degree readings in a century. The five hottest summers (1936, 1934, 1954, 1980 and 1930) all occurred with CO2 below 350 PPM. CO2 went over 400 PPM this year, indicating that heatwaves and CO2 have nothing to do with each other. Scientists who claim otherwise are either incompetent, criminal, or both. This is evidence of the Extreme weather we were promised by the “Experts” at NOAA and Weather Underground! This year will be considered even more extreme than any before. Weather has been extremely pleasant. Doesn’t that qualify as extreme weather, just like the extremely nice golf weather during March 2012? These people can’t predict the weather tomorrow much less 5 years from now. NOAA predicted once again a record year for hurricanes…giant fail. They should fire everyone that has a job predicting hurricanes and let a monkey throw a dart at a number. Asshats all of them. UHI, and cherry picking GHCN stations. Nuff said. I like the term “criminally incompetent”. Says so much in 2 words. We are going on 16 days in a row UNDER 100 degrees. In August. I’ve been in Central Texas over twenty five years. Can’t say I ever remember this happening in August. Of course the enviro nutties refuse to talk about it. Don’t kid yourself. Mother Nature has been hearing Al Gore and the Eco-Socialists at the UNIPCC predict Thermageddon, more frequent/violent hurricanes, etc. This, and the 7.6 consecutive years with no cat 3 hurricane hurricanes hitting US coasts (the old record for consecutive years was 6. It stood for over 100 years, until 12/11/11), only prove that Mother Nature sees these clowns for what they are. “Nobel Prize for Global Warming? Ha! I’ll show them. Wham, lowest #100 degree temp days since 1910 in US. Keep watching, especially at green lib rallies on climate. We call it The Gore Effect (rains, cold, ice, storms, snow wherever he holds a speech or rally). We had 49F yesterday. We had only one day at 95 F and twelve days between 90F and 93F ALL summer in North Carolina. In May 2004 we had 17 days at 90F and above, two at 98F and six days over 90F in April. Global Warming, Heck it is still August and I need a blanket…. Sleeping comfortably under two blankets at my house in Colorado this morning. Michael Mann: would he sue? would he win such a suit? would anyone? Huh. How was last year the ‘warmest ever’ in the US with hardly any 100 degree days? 2011 and 2012 were both hot as hell in Arkansas, plenty of days over 100, drought conditions, burn bans over the entire state. Got up to 114 in Little Rock. This year I don’t recall a single day over 100 in my town. Just some facts. Whats amazing is this is truly the real data….that’s unknown by most of the general public. Media rules public perception. Even my 12 year old gets it. Isn’t this just one of the “wild swings” manbearpig predicted? Bush lied and, um, temperatures died…. I’ve had to have this conversation many times due to my job. The religionists will come back by saying this year is a statistical anomaly…even had one person say a “rest” in temperature rising is normal and expected (???) Had a woman last night tell me she is fighting against climate change because of the poor and neglected people of New Orleans – she believes in her heart that Katrina was a product of “climate change” and that poor people all over the world are suffering because the “rich” (industrialized nations) are ruining the planet – the poor are the only ones suffering because the rich can afford to protect themselves. WOW! Talk about mixing religions!! Especially since Save The Wetlands was the greenie organization that fought the construction of two hurricane barriers in the 90s – barriers that would have saved New Orleans. Sure it was cool here but look how positively hot it was in the southern Hemisphere this winter. Wasn’t it? You must be referring to the record cold in South America. That is why they changed the name from global warming to climate change, and changed their predictions to predict extreme weather events. The climate will always change in one direction or another, and records are always broken eventually, so this way they are always right and we are always wrong. See how much easier it is to make oracular “scientific” predictions, when the prediction is always right, no matter what happens. The climate “science” leftists just wized up, and started taking prediction lessons from the astrology people. When the coal fired electricity plants begin to go offline due to new EPA regulations by Obama executive order, and your electricity bills increase at an ever increasing rate, remember, the numbers show, there is NO man caused global warming… ask yourself why? You have it all backwards. Climate change is leading to more and more extremes. This extreme lack of extreme weather is merely the latest proof that climate change is real.